The very Victorian Eisenhower Office Building, Washington, D.C.
​This vast French Renaissance style office building was designed by Alfred Bult Mullett. As first conceived, it was for the use of the State department alone. The final design included the State, War, and Navy departments in separate wings. Construction began in 1871, and with appropriation delays, etc., it was not completed for some 17 years and the final cost was in excess of $10,000,000. But what excess: the final bill came to approximately $1,000,000 per acre of enclosed office space. At that time, 1888, it was the largest office building in the world. 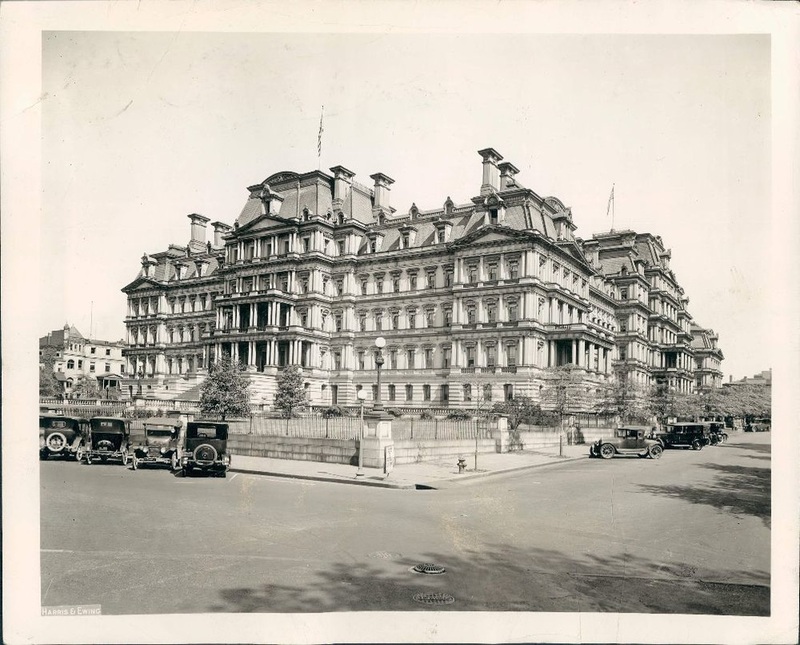 With the exception of the doors and hydraulically operated elevator cabs, the construction was designed to be fireproof, largely of plastered masonry with cast iron framing and decorations. The expansive french roofs were completely framed in iron, and much of the roof ornamentation, including the gables and towering chimneys were entirely ornamental cast iron. Richard von Ezdorf, an amazing late Victorian architect, completed the impressive interiors, with three cast iron framed and ornamented libraries and suites of elegant offices. Originally there were more than 150 fireplaces. ​Second quarter of the 20th century press photograph. Private collection. The Historic Preservation Office (HPO) promotes stewardship of the District of Columbia's historic and cultural resources through planning, protection and public education. HPO is part of the Office of Planning and serves as the staff to the Historic Preservation Review Board and Mayor's Agent for historic preservation. HPO also implements federal historic preservation programs as the State Historic Preservation Office for the District of Columbia. ​​The District of Columbia SHPO is one of the preservation offices established in each state and territory under the National Historic Preservation Act of 1966. SHPO duties include historic preservation planning, survey and identification of historic properties, public education, review of government projects affecting historic properties, and promotion of federal preservation tax incentives. The Historic Preservation Review Board designates historic landmarks and districts, makes recommendations to the Mayor on construction affecting those properties, and serves as a forum for community involvement in historic preservation. HPRB is composed of nine professional members and private citizens appointed by the Mayor and approved by the Council of the District of Columbia. It also serves as the State Review Board for the District of Columbia, under the National Historic Preservation Act of 1966. The mission of the DC Preservation League is to preserve, protect, and enhance the historic and built environment of Washington, DC, through advocacy and education. The Historic Districts Coalition is an informal alliance of organizations and individuals representing Washington, D.C.’s historic districts—those that have been designated under the provisions of the Historic Landmark and Historic District Protection Act of 1978 (D.C. Public Law 2-144)—as well as others interested in historic preservation, including residents of undesignated neighborhoods and representatives of neighborhood organizations, historic preservation organizations, and preservation-related businesses. The Capitol Hill Restoration Society (CHRS) was founded 60 years ago to help preserve and protect the historic neighborhood’s architectural and residential character. Due to the efforts of CHRS, Capitol Hill won designation as a historic district in 1976. CHRS, formed as a non-profit group, is now the largest civic association on Capitol Hill, and one of the largest in the District of Columbia. CHRS continues to play a key role in maintaining the integrity, history and appeal of the neighborhood which has been a diverse community for more than 200 years. The Historical Society of Washington D.C.
We explore the unique Jewish heritage of Washington as a hometown and as the nation's capital. CPHS was founded in 1985 by a group of neighbors to promote interest in the history of Cleveland Park and to encourage preservation of its architectural heritage and character as a friendly residential neighborhood with a strong sense of community. The Cleveland Park Historic District was designated in November 1986 after extensive research by CPHS and was listed on the National Register of Historic Places in April 1987. The Architectural Review Committee was formed in 1987 and meets monthly to review building permit applications and make recommendations to the D.C. Historic Preservation Office.